Q. 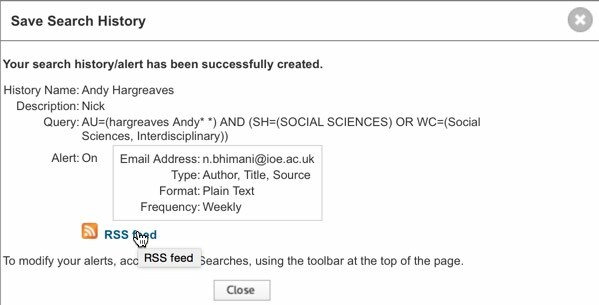 How can I set up an RSS feed for an author who is indexed in the Web of Science? I would like to do this to keep updated on this particular author's scholarly output. 2. You will be asked to authenticate to the Web of Science (WoS) if you are accessing the database remotely. Please type in your network username and password. 4. Enter the author's surname and first name or initials (Hargreaves A* (the asterisk is a truncation symbol which will bring up variations on the first name e.g. Andy and Andrew). 5. Then select the Research Domain e.g. 'Social Science' and then Finish the Search. 7. This will bring up relevant results. 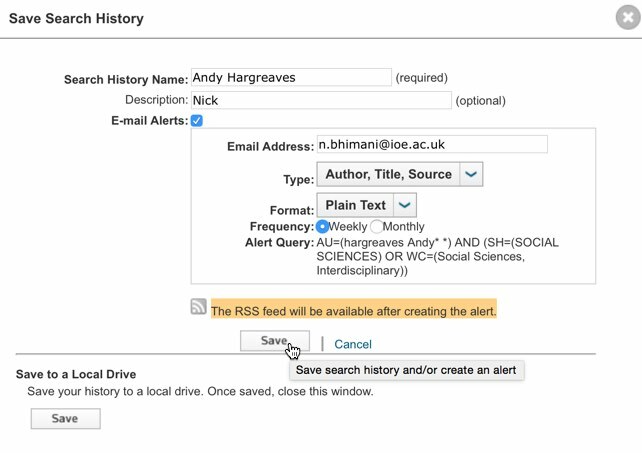 In order to create a RSS alerts, first save the search. To do this, go to the Search History and then Save History/Create Alert. 8. You will be prompted to enter your username and password to sign in. This is the email address and password you used to register with the Web of Science. - this is the email address and password you used to register with the Web of Science. 9. Then give your search a name and save. NOTE: The RSS feed is created after the alert is set up. 10. Click on the RSS Feed icon after your search history/alert has been created. 11. 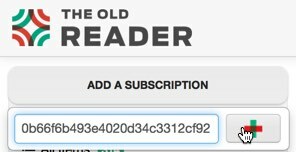 Copy and paste the URL to your RSS Reader to subscribe to the feed. In the screenshot below, The Old Reader is being used as the feed reader. 12. The next time the author's work is indexed in the database, you will be alerted to this via your feed reader. Tip! You can also check to see if the author has a Google Scholar profile (see also http://libanswers.ioe.ac.uk/a.php?qid=353401) and set up an alert in order to get updated on this particular author's publications that are not indexed by the Web of Science.